If you think that you've got ITB syndrome, then start treating it straight away. ITB stands for Illiotibial Band. I have suffered twice with ITB syndrome and I hope I now know enough to make sure I never get it again as it can really sideline you for weeks, if not months. Your IT Band (illiotibial band) is not a muscle, but a band of tissue that runs from the top of your hip, down the outside of your thigh, passes round your knee cap and then attaches at the top of your tibia (the front bone of your leg, just below your knee). 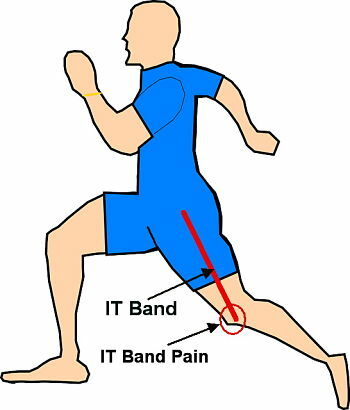 The main role of the IT band is to stabilise your knee when your foot hits the ground. IT Band Syndrome (ITBS) is when the band gets inflamed, usually around the knee area. It is a result of the band rubbing or squeezing on a knobbly bit of bone at the base of your thigh bone, just above your knee. The pain is not nice. It feels like the IT band is rubbing on something and with every step that you take, you can feel a burning, searing pain. The outer knee area is the most common area of pain but others can feel pain along the outer side of the thigh as well. Running will be painful with each foot strike and if you let it get worse, even walking will be sore, especially when going down hill or down stairs. In my cases the cause is weak hip muscles. The more miles you do and the longer you run, the more your core and hips get fatigued. This fatigue can cause your hips to turn inwards which in turn rotates your knee inwards which results in a sort of crushing of your IT band. Other possible causes, include old trainers not supporting you properly, running on cambered roads (the sloped bit on the side) and the tight turns on running tracks. The best advice is to nip it in the bud early on. Don't let it get so inflamed that you can't even walk properly. Think of the treatment as a 2 stage process. The first is to treat the inflamed band and the second is to work out the cause and do something about it. Ice your knee straight after your run, for about 10 minutes. How to ice correctly. Take a couple of days off running. This is very important. Start hip strengthening exercises and continue doing them for at least 6 weeks. This guy Jason does a great explanation and I still do these 3 times a week, well most of the time ;). 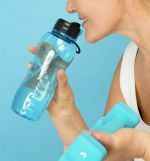 You will need a thera band. Start gentle hip stretching. I found some great yoga stretches which helped me hugely. I did them every morning for about a month and now I do them if I feel that my hips are tight. Yoga for Runners. A lot of people like foam rolling the IT band but I am not a big fan and I think it just aggravated mine. And if Your IT Band is Still Sore? The inflamed area can take from a few days to a few weeks to settle down depending on how much damage that you have done. That is why I always take a few days off when I feel that familiar soreness coming. 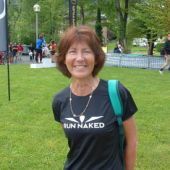 The first time I suffered IT band syndrome, I carried on running hoping it would go away on its own. I ended up being forced to take 5 weeks off running. Lesson learned. I saw a physio twice a week for a month and had massage and ultrasound therapy. I'm not sure that this helped much. I am a fan of acupuncture but it didn't help my IT band pain at all. I liked the snug feeling that this gave my knee and it definitely reduced the pain as it kept my knee in a more neutral position. I wore it during the day whilst I was rehabbing. This is designed to be worn ABOVE the knee. It has a small padded area that sits on top of your IT band and so compresses it and stops it rubbing. This didn't work for me but what did work was placing it tightly BELOW my knee. I'm not sure why it worked but it did! I wore this once I restarted running and if I felt a slight pain it immediately got rid of it. I hope that you don't have to go through this, but if you do, be a bit patient as you can get on top of it and definitely treat it as early as you can.